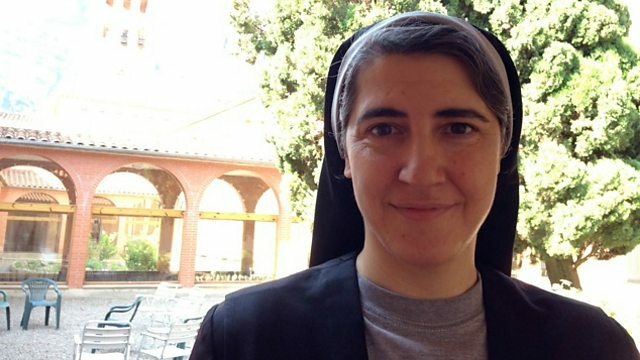 A radical Catalan nun who has become one of Spain's most recognisable anti-capitalist campaigners. Sister Teresa Forcades is on a mission, from the mountain-top monastery just outside Barcelona that she calls home, she combines the life of a nun devoted to serving God - and politics. She is devout in her faith and avowed in her criticism of many aspects of Spanish life, including most vocally its government, especially its economic policy. She travels tirelessly around the region speaking at rallies and public meetings, she is a regular guest on TV news programmes and is regularly quoted in newspapers. As Matt Wells found when he spent time with the Harvard-educated 47 year old, she is also a firm advocate of Catalan independence, the nationalisation of the banks, leaving the EU and a Spanish revolution - albeit a bloodless econmic one. She is softy spoken, often smiling, always in a hurry, and is the figurehead of a 21st Century Liberation Theology; that's known in Catalan as 'Proces Contituent' which tens of thousands of people have signed up to. There are many who consider her vision for Spain would be a disaster, and she has made many enemies, not least in the Vatican where her ‘off-message’ views on abortion and birth control don't sit altogether comfortably with the Catholic church's teachings. There is no denying though that Sister Forcades is a dynamic political force whose faith and calling, she says, doesn't conflict with her high profile and outspoken politics. Far from it, she says, it drives it.